Alcohol is a drug that affects your body in many ways. It can alter your mood, judgment, reasoning and muscle coordination--all very important things when it comes to operating a motor vehicle. After conducting several studies, researchers found that when a person’s blood alcohol content (BAC) reaches .08%, this is the point at which it becomes too dangerous for them to safely drive a motor vehicle. Therefore, in all states, it is illegal to operate a motor vehicle with a BAC of .08% or more regardless of whether or not a person is actually intoxicated. This is known as a “per se” violation. For an average person with a BAC as low as .02%, you’ll start to lose your ability to focus on objects that are moving fast and will notice a decline in your ability to perform two tasks at the same time. These are both important skills to have when driving a motor vehicle. When a typical person’s BAC reaches .05%, they will have more difficulty steering and will lose some coordination. They may also have a reduced response to emergency driving situations. Speed control, concentration, impaired perception, short-term memory loss and the ability to process information all become more difficult for many people with a BAC of .08% or more. Once a person’s BAC reaches higher than .10%, it becomes extremely dangerous for them to drive. At this point, alcohol starts to have an affect on speech, balance, the ability to think and can make it difficult to maintain lane position and apply the brakes when needed. 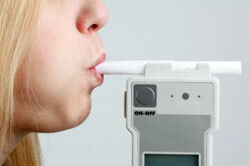 Taking these factors into account, all states have adopted strict DUI laws and penalties. Even for a first-time offender, a person convicted of DUI may face expensive fines, substance abuse treatment, DUI school, community service, probation, driver’s license suspension and even jail time.